A crew that knows and communicates situations such as infield fly and time plays crisply stays a step ahead of the game and its fans. A momentary lapse in concentration or communication, however, can render confusion on the base paths. In order to make sure all umpires are on the same page, "each umpire team should work out a simple set of signals" (General Instructions to Umpires). This not only applies to correcting a manifestly wrong decision, but to communicating game situations. 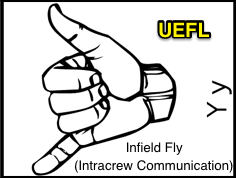 In general, specific signals are communicated amongst the crew prior to at-bats during which the following might occur, due to the number of outs or runners on base: 1) Infield Fly, 2) Time Play. Additional communication should take place between at-bats regarding: 1) Number of outs, 2) Rotations (e.g., which field umpire is going out on a fly ball, who is staying home, etc. ), and 3) Shifting of responsibilities (e.g., base/plate umpires' responsibilities for an "infield in" situation). Warnings or problem players may also be communicated. Finally, umpires should have a signal to request a consultation amongst the crew. Think of a rhyme: "Infield Fly, ASL 'Y'"
By now we know quite well that the infield fly rule contains three criteria: 1) First and second base occupied with less than two out; 2) Batter hits a fair fly ball which is not a line drive or bunt, that; 3) can be caught by any infielder with ordinary effort. We also know that "ordinary effort" is defined in the rulebook as "the effort that a fielder of average skill at a position in [MLB] should exhibit on a play, with due consideration given to the condition of the field and weather conditions." Infield Fly is called well in advance of the drop. With one out and two on, the batter hits a shallow fly ball to the second baseman. As the ball reaches its apex, the second base umpire rules infield fly by pointing skyward, a mechanic which is mirrored by the crew. The infielder allows the ball to fall untouched onto the ground in front of him, picks up the ball, and throws to the shortstop covering second base as both baserunners attempt to advance, apparently unaware of the infield fly rule's invocation. R1 advancing from first base is easily tagged and declared out for an inning-ending double play (R2 safe at third). Related Post: Infield Fly Rule Knowledge Costs Giants as Reds Turn Two (7/4/13). A non-infield fly results in a double play. With none out and runners at first and second, batter hits a high fly ball to shallow left field, where the shortstop attempts to make a play. Umpires determine that the shortstop cannot catch this ball with ordinary effort since winds were gusting above 30 miles-per-hour during the play. Thus, no infield fly call is made. After the ball falls untouched to the grass, shortstop throws to second baseman, who tags baserunner R2 before stepping on the second base bag. 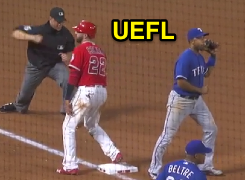 Knowing that his crewmate had not invoked the infield fly rule, the second base umpire properly calls both R2 (tag) and R1 (force play) out for a double play. The crew chief entertains the offensive team's argument, explains the call, and the game proceeds without incident. Related Post: Orioles Turn Triple Play on Contested Infield Fly No-Call (5/3/17). U3 improperly calls R2 out on a non-force. With one out and two on, batter hits a high fly ball in front of the pitcher's mound. The only umpire to make a call before the ball falls to the ground is the first base umpire. After the ball falls, baserunner R2 takes off for third base, which draws a throw from the first baseman. Before R2 arrives at third base, the fielder covering third catches the ball with his foot in contact with the base, as in a routine force play situation. 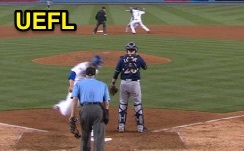 The third base umpire then declares the runner out at third, apparently unaware that the infield fly had been called. To rectify the situation, the crew rules the batter out and awards R2 third base (as R2 had never been tagged while off his base). The sign for time (not "Time" as in time out). Similarly, Time Plays begin before the pitcher even toes the rubber, with umpires employing another crew signal—often a touch of the wrist similar to the ASL sign for "time" or "watch"—so everyone is on the same page prior to what could very well end up as a time play. A crew could even borrow a page from ASL by incorporating the number of outs into the time play signal: one finger on the wrist for one out, and two for two outs. Chances are a time play signal won't be necessary with zero outs. It matters not so much what the precise signal is, but rather that all officials are on the same page in regards to intra-crew communication. An inning-ending double- & time-play in LA. Naturally, it is also important to know what is and what isn't subject to timing considerations. We're obviously looking for whether a run scored or not before a third out non-force tag, but recall that appeal plays are not force outs, so appeals are also potential time plays. A time play can occur whenever: there are two outs and at least one runner on base; or there is one out and at least two runners on base. Though extremely unlikely, it is also technically possible to have a time play with zero outs and the bases loaded (e.g., batter hits an infield fly [first out], runners attempt to advance; R1 and R2 are both tagged off their bases [second and third outs] prior to R3 touching home plate). With one out and runners at the corners, batter's fly ball to left field is caught for the second out as both runners tag. Lead runner R3 crosses home plate as trail runner R2 is tagged out going to second base. Plate umpire observes the play and signals the run has scored prior to the third out having been recorded. Related Post: Tmac's Teachable Moments - The Time Play in LA (6/17/16). Related Post: Not So Fast - Unique Time Play Plates Indians a Run (4/4/17).